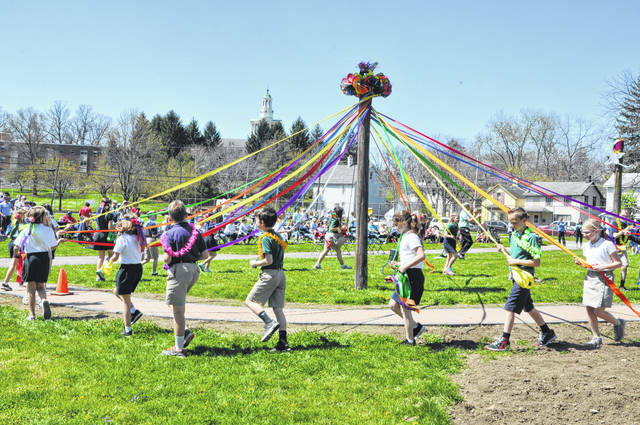 Fourth- and fifth-graders from St. Mary School perform a dance around the maypole Tuesday at Boardman Arts Park in Delaware. The poles, used to hold volleyball nets, were decorated by Creative Foundations for the celebration. St. Mary music teacher John Blakeslee (on right side in blue) said he spent three or four weeks teaching the dance to the students. Students dance around the maypole, twisting ribbon as they danced until the top of the maypole was decorated Tuesday at Boardman Arts Park in Delaware. 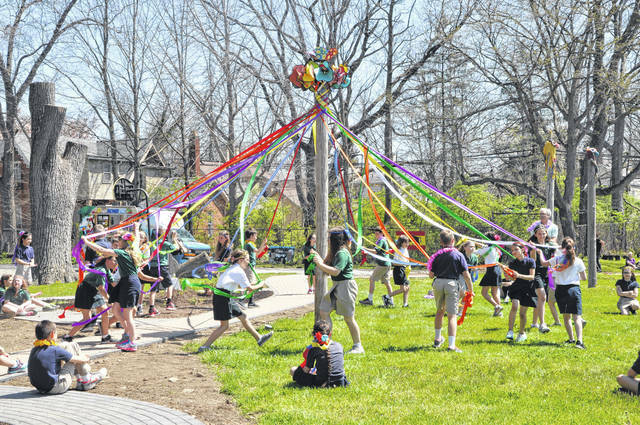 St. Mary School celebrated May Day and the end of winter Tuesday by dancing around maypoles at Boardman Arts Park, 154 W. William St., Delaware. The mention of an end to winter drew a big round of applause from the more than 100 attendees who turned out for Tuesday’s event. Blakeslee explained that he spent the last three to four weeks teaching students how to dance around the maypole and said because of the cold weather, someone had to build a practice pole in the gym at St. Mary so the students could practice. The students did three dances around the poles and then did two dances with members of the audience, wrapping ribbons around the maypoles as they danced. The event was put on by the Northwest Neighborhood Association in conjunction with numerous community partners and sponsors. Amidon added Blakeslee did a “wonderful” job with the celebration and hoped the community could come out for more events at the park in the future. For more information about the park and upcoming events, visit delawarenna.org. https://www.delgazette.com/wp-content/uploads/sites/40/2018/05/web1_DSC_0302-1.jpgFourth- and fifth-graders from St. Mary School perform a dance around the maypole Tuesday at Boardman Arts Park in Delaware. The poles, used to hold volleyball nets, were decorated by Creative Foundations for the celebration. St. Mary music teacher John Blakeslee (on right side in blue) said he spent three or four weeks teaching the dance to the students. https://www.delgazette.com/wp-content/uploads/sites/40/2018/05/web1_DSC_0268-1.jpgStudents dance around the maypole, twisting ribbon as they danced until the top of the maypole was decorated Tuesday at Boardman Arts Park in Delaware. This entry was tagged st mary. Bookmark the permalink.